Do designs in alignment, but then break up all the objects into “cut sheet” layers organized by the material they need to be cut from. Do design in exact dimensions without kerf compensation, those tiny .002 changes are nearly invisible and will drive you crazy. “Did I already compensate that?” I only every apply the compensation to a copy of a single layer I’m going to cut and then save it out as a ToCut version of just that layer. Design with groupings for easy editing, but collapse parts down into individual compound paths using the path finder when you are making your cut sheets. This helps offset paths do the right thing for kerf compensation. If everything comes out right, but you have a few holes that are way to large, you forgot to collapse them, and the kerf compensation made them bigger instead of smaller. Control Cut order. 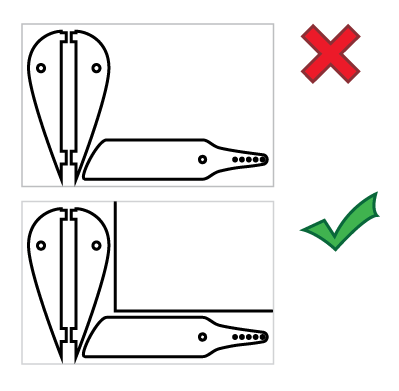 If you’re cutting open paths or have closed paths that overlap the normal “inside before outside” cut ordering won’t apply if you care about cut ordering organize the parts into separate cut passes. Look out for exactly duplicate paths hidden on top of one another. That causes double cut problems. Find them by zooming way out so the anti-aliasing makes the overlapping ones appear darker. Avoid paths that are too close together. The thin sliver of material won’t be able to dissipate the heat as well as a wider section and may melt or burn. Use tape to hold pieces in so the excess material forms it’s own parts organizer. You’ve already carefully laid these things out in an nice sheet, why not take advantage of that? Use 3 ring binder sleeves to hold on to thin sheets of organized parts. If you’re using the tape and excess material trick above, if you limit yourself to 8.5″x11″ sheets of thin material you can orgnize a zillion sheets in one three ring binder. Just be careful not to pick it up upside-down. 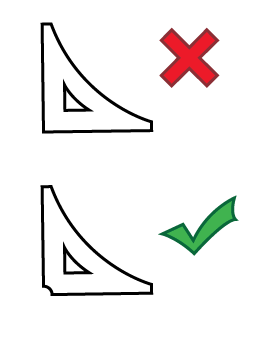 Use pulse rate to control edge properties lower on wood for a less chared edge. Higher on plastic for smoother finish. Remove uneven protective coatings. If cutting pastic with an uneven or bubbled protective sheet of plastic on top peal it away first to get more consistent cuts. raster areas into blocks to minimize the raster span. When raterizing the laser goes back and forth over and over. The shorter the distance it has to go the quicker the raster progresses. Clumping your raster parts can really cut down on the amount of time spent waiting. Pay attention to the grain orientation on wooden parts. It’s important visually and also important structurally. It’s not as important for plywood. Use char artifacts to you advantage. When laser cutting wood the compressed air blast adds a charred “cut shadow” on the upper surface, you can orient parts to take advantage of this, by making that shading part of the design. Do small test cuts with a particular laser and material before deciding on the settings for a long set of cuts. I usually use some 1/4″ circles in a scrap area of the design. On wood go a bit slower than your test cuts indicated. Wood is not a uniform material go slower/use more power than the minimum you needed for your small test cuts so as not to leave a few tough areas uncut at the bottom that you’ll need to cut loose and touch up. Push not-fully-cut wooden parts toward the bottom. If the wooden part very nearly cut though and you’re able to just push the parts free, pushing on the top of the part makes sure that any splinters that pull free at the uncut areas pull free from the scrap around the part. If you push the other direction the splinters come off your part, and ruin it. Use a wood burning pencil to hide hand cut edges. If you have to cut some wood loose, trim splinters, or sand down some edge it will leave unburnt bright wood in the otherwise evenly burnt edge. You can shade these areas in with a wood burning pencil or cheap soldering iron so they mostly disappear. Don’t make everything a rectangle. Part of the lasers power is awesome curve cutting. Don’t make everything a rectangle. Add some curves. Not everything has to be 90 deg or a strait line. Do not assume everything is a box. Use the scrap around a cut piece to form a handy clamping jig. If you use complex shapes they can be hard to clamp for gluing. The scrap material around your part fits it like a glove and a few extra cut lines can make that come free and you can use it to hold your part in a clamp while gluing. If your forming a box edge with mating fingers don’t use alternating squares. Work joins into your design. Make a nicer more intentional patterns. Hide slot an tab connections if you can. Sometimes you need some tabs and slots to hold on a part, and you haven’t been able to make the tabs fun enough to work into your design, you can do other things to deal with them. You can hide them under glued on decoration or reinforcement pieces, you can position them under other attaching pieces. You can laser etch transitions to make them more interesting than just a weird rectangles. Jazz it up. Use an alignment jig to force holes and pins to be plumb. Just because a pin joins two pieces don’t assume that the pin is plumb, the conical cutting of the laser means there’s nothing forcing it to be plumb. For 1/8″ pins I use a drill press to make a 1/8 plumb hole in a piece of wood, and put a stub of 1/8″ rod in that hole. Now if you stack two pices on the rod and down onto the surface they’ll be reasonablly plumb and you can glue them. Use the protective paper on acrylic as a paint mask. If you laser etch into acrylic though the protective paper, the remaining paper makes an awesome paint mask. 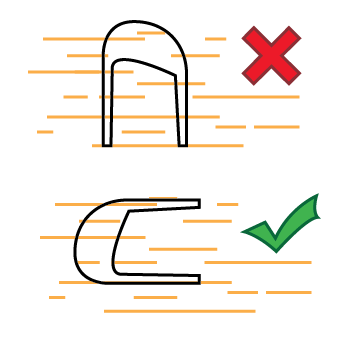 If you don’t need super alignment between the raster and vector cuts you can even do the raster pass first, paint, and then do the vector pass. That lets you paint the whole sheet willy nilly without having to worry about getting paint down in the cuts, or having to paint individual little pieces. Take care to use some extra power/slowness to fully etch though the paper and into the plastic. If you “only just barely” etch though you can have sticky residue from the paper still on the plastic and that is real pain to remove. If you’re cutting lots of small plastic parts consider pealing the protective paper away first. If you don’t need a super pristine surface finish free of any slight fogging near the cut lines it’s way easier to just peal the protective paper/plastic away before you cut. It’s a time sink peal it off a zillion tiny parts individually. Use extra cut lines to separate and save unused areas. 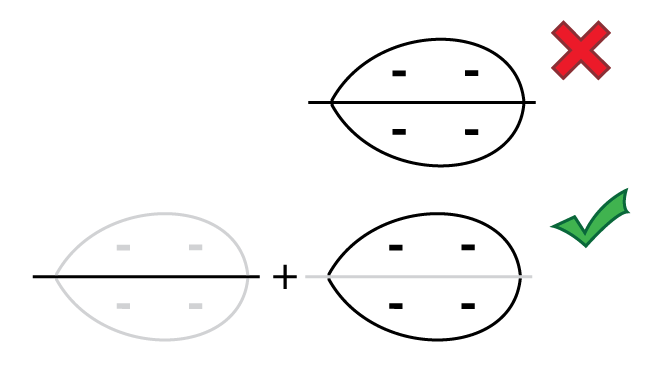 When you lay out parts for cutting, you often have some areas that are not used. If you add some extra cut lines to cut those ares into their own rectangles. It’ is much easier to re-use that material and it’s much more compact to store. Trying to hit some good areas in a big sheet full of holes is hard and a waste of your time. Cut fancy paper weights. If you’re cutting very thin things like paper it will often just blow away while you’re cutting it because of all the air motion in the machine. If you take a wood or plastic sheet and cut out a part just inside/outside the lines you’re cutting in the paper the sheet can form a curve hugging paper weight for both the inside and outside of the cut. With those pieces in place while you cut the paper stays put. Use tabs to hold paper shapes in place. Paper parts can blow away so put gaps in the cut edges to keep them in place. Position the tabs where it will be easy to trim them (avoid corners or curves) Cutting the gaps screws up the lasers inside/outside cut ordering so use explicit layers to control ordering. You can get away with a single tab if you put it “upwind” of the direction the compressed air on the laser will be blowing. Make a paper clamp. If you want to cut a lot of sheets of paper all at once you can use the “fancy paper weight” idea but use 1/4-20 bolts and wing nuts to make a clamp to hold the paper together as a single chunk. (be on the lookout for fire though!) I did this to cut secret compartments out of books. It works but is messy and kind of a pain. Use the mechanical properties of your material. Thin areas can be used to add springiness Keep in mind that sharp corners and nicks can concentrate stress. Cut some extras. It’s always a trade off between cutting time and output, but if your project needs 5 of something consider cut 6 or 7 of them. If they’re tiny or easily broken cut more. Look for the flash. If you want to know if the laser is compeletly cutthing though your material, look for the flash as the laser hits the honeycomb support below the material. If there are no flashes then you’re not getting all the way though. This is easier to see with acrylic, not so easy to see with wood, etc. For 90 deg braces cut out the inside corners. If you are added braces to hold other pieces in alignment, and they’re just a tiny bit off the inside corner of the brace will push the brace away and spoil the glue bond. Removing the inside corner makes the glue up more forgiving and makes for stronger joints. Use water to deal with bowed wood. Often with a sheet of plywood it will be somewhat cupped. Instead of trying to fight that with weights you can use a paper towel and water to moisten the concave side. In a couple of minutes the water will make that side of the wood expand and flatten out the wood. I’ve used this to great effect on 1/4″ plywood. Use water to protect thin sections on multi pass cuts. In wood it’s easy to have thin sharp angled features char badly on the second pass. Between passes use a syringe to put a tiny amount of water into the groove at these points. The water will soak into the walls and keep them from charing as badly on the next pass. Etch an alignment aid. Want to laser etch consistently at a specific location on an uneven shape? Etch an alignment sheet with the outline of the foot of the shape and use that to position the parts. If you etch the alignment sheet deep enough it can even positively position the part since it’s footprint will click into the etched depression. You can even use a flat bed scanner to figure out the footprint if it’s complicated. Spiral cut to make deep pockets. Want to cut a deep pocket that doesn’t go all the way though? 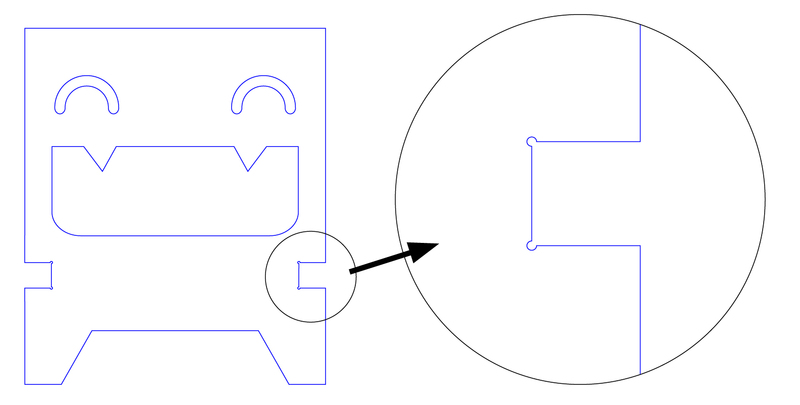 You can vector cut a tight spiral. You have to experiment with the specific material to get the right spacing. If you can try to etch from the center and spiral outward. Watch out for major heat build up. Fire risk. Be careful about versioning. If you have a project witha lot of parts and your iteratively improving the parts take care not to mix versions of the parts. It’s better to pitch old versions of the parts then to try and tell which ones have modified slots that are 0.005″ narrower. Check design orientation when cutting multiple passes in wood. 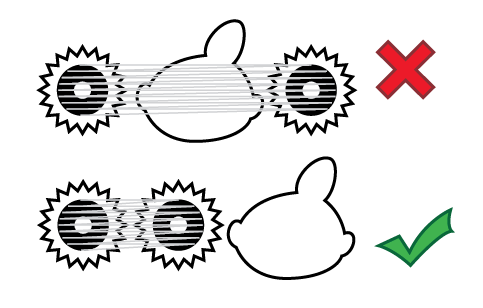 If you have long features where the laser moves in the same direction as the forced air at the cutting head that air will blow back along the cut fanning any coals formed on the walls. This makes the charing much worse. 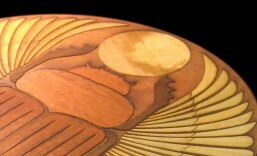 Try to orient the wood so the air blows across the grooves not along them. Slow rasterization for dark details. I used to always use max speed for rasterization, and adjust power to suit, but if you’d like to put dark details on wood it’s better to use lower power and slower speed to char dark details that are not deep. Cut part way though to do kerf bending. If you cut a lot of parallel lines most of the way though the material it makes the material much easier to bend. If you are doing this in wood make sure to cut perpendicular to the grain so it doesn’t just split when you bend. If you have other laser cutting tips put them in the comments! This entry was posted in Uncategorized and tagged DIY, Laser Cutter, Tips. Bookmark the permalink. I haven’t had occasion to run into any of this (not having access to a laser), but these all sound like really great tips that only come with experience. If I ever do get to use one, I’ll be sure to come back and read through them again. These are awesome, thank you very much for them! I would add a couple specific ones for acrylic. 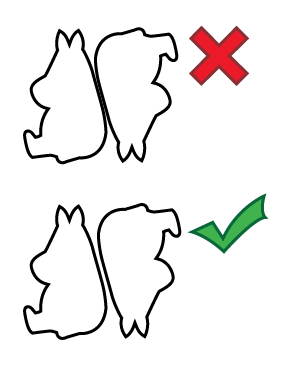 1) If you are cutting shapes that are supposed to fit together without glue (using interlocking, as it is common to see in some acrylic cases), adjust the object shapes, given the width of your material. A 3mm acrylic plate isn’t exactly 3mm, and you can have a big variance of width in the very same plate. I have had plates that you could measure a width of 2.85mm on one side, and 3.12mm on the other. 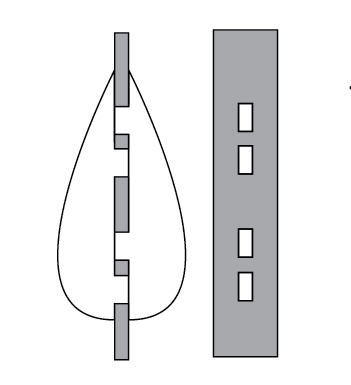 If I had cut a part with a regular 3mm spacing, an object cut on one side would be very loosely fit, while the other will have a very tight fit, possibly breaking the other part, due to stress. Great additions! I can’t believe I forgot to talk about avoiding stress risers in acrylic. That’s so important since not only is the acrylic brittle to start with the heat affected zone around the cut adds even more locked in stress. Thanks for chiming in! My pleasure! It is a great list, mind if I translate, link to this post and repost in my Brazilian blog? I appreciate your tip to design with groupings when laser cutting. I’ve also seen paths put too close together when laser cutting and it kind of ruined the pattern. Thanks for the tips, I’ll pass them along to my friend who is into laser cutting. Thanks for sharing this useful tips. You must know on which surface you want apply the laser cutter. While cut the things using Laser you need to be more careful otherwise it is harmful to your body. Thanks for mentioning to make sure that you avoid paths that come too close because the material will be too thin there. I have been thinking about getting into laser cutting, and I am looking for any tips I can find. I will make sure I keep this in mind as I move forward. I really like the idea of using a wood pencil to shade in burnt parts. I have been thinking of working in laser cutting, and I wanted to know how to make things look better. I can see how shading with a pencil, could provide a more professional look. It really helped when you mentioned the importance of choosing the best cut order when using laser cutting tech. I can see that paying attention to this can help you make sure you make the most out of your material and avoid making mistakes as you cut. As I see it, consulting with a professional and have them help you do the laser cutting can help you rest assured knowing that you will get quality services. I like that you suggested using water to help flatten out wood before cutting. I have been wanting to start working as a laser cutter, and I wasn’t sure how to start. I can see how it would be better to flatten your wood so the cutting process doesn’t get messed up. When cutting acrylic without the protective paper, spread a drop or two of dish soap on the surfaces to act as protective film. When dry, laser cut and rinse with water and the residue on the dry soap will wash away. Oh great tip. I’ll have to give that a try. Thanks for contributing! This is some really good information about sheet metal fabrication. It is good to know that it would be smart to avoid getting paths to close to each other when laser cutting them. I didn’t realize that can affect how things come out.